Buying a new build has many benefits. Miller Homes is an award winning housebuilder who pride themselves on creating homes that are perfectly suited to the way that we live today, homes which are energy efficient and clever in design but also on which we can make our own imprint. These homes suit our lifestyles and are adaptable to our personal situation, whether you are a couple planning for the future or a family of five who need plenty of space. Miller Homes is renowned for building quality new home developments in Yorkshire and across the country. In 2018 they were awarded 5 Stars for customer satisfaction in the HBF National New Home Customer Satisfaction Survey, 11 Quality Awards and three Seals Of Excellence in the NHBC Pride In The Job Awards. They are dedicated to building beautiful family homes and have, over the years, seen many families thrive and flourish in their properties. They aim to build in the perfect locations, creating neighbourhoods where families can live, work, make friends and enjoy life. The very first home that I purchased with my husband, Joe, was an end of terrace new build property. There were three bedrooms - two doubles and one small (one with an en suite shower room) – plus a family bathroom. Downstairs, there was a small entrance lobby with a cloakroom which opened into an open plan living room, taking you through into the kitchen diner. We bought it off plan and rented a flat just around the corner so we watched it being built every step of the way. It was perfect for what we required – my husband worked long hours and I worked in London, commuting daily, so the idea of buying a property that needed renovation or significant update wasn’t feasible. I have the best memories of this little home – our daughter was born whilst we lived there, so I spent much time within it, either pregnant or frantically trying to cope with first time motherhood, mostly with the assistance of Gina Fords Contented Little Baby book and plenty of Sauvignon Blanc. When we moved in, we were faced with a blank canvas. We had no real furniture to speak of and immediately rushed out to the local pine shop to purchase. This was, looking back, an error. Not only did our home have more pine in it than a National Park but we had bought in haste and worse, bought for practicality which meant that none of the pieces were particularly special to us. It took me fifteen years, most of which was spent upcycling in every paint colour possible, to finally trade in these panic buys and find items that I really loved for our home. As an interior blogger and Instagram content creator, one of the questions I am most regularly asked is how to decorate a new build home so that you can portray your individual style. Although a blank canvas can appear a perfect starting point, it can sometimes be a little overwhelming and it can be difficult to see how it can be pulled together to reflect your own personality. Here’s my top five tips to help make your new build your own. Use Pinterest to plan out what you want to do in your new rooms – create a board for each and add to it regularly with ideas. You’ll soon find that you’ll start pinning similar themes and colours – this is a great way to narrow down your own personal style and help you create rooms that you love. Instagram is a great place for inspiration – follow hashtags such as #myhomevibe to see current trends and ideas from real homes. There’s plenty of new build inspiration too – try #newbuild or #newbuildhome. Don’t just rush into filling your rooms as quickly as possible. It’s perfectly okay to live with empty spaces if you haven’t found the perfect piece yet. And if you can’t live with a lonely corner, add a plant until you’re ready. When you walk into a room, it’s important to have several focal points. This creates a more interesting space and will encourage the eye to be drawn to your favourite items. The fireplace is an obvious focal point, but you don’t need to stop there. Make sure that each corner of the room has something to see – a small side table, a favourite lamp or a group of art prints can bring life to what can otherwise be a dull space. Use mirrors to reflect the light in darker corners and make sure you have plenty of mixed height lighting to show your room to its best advantage. A standard lamp behind a sofa, for example, can create a cosy reading spot when teamed with cushions and a soft throw. One of the most exciting things about buying a new build home is being able, in many cases, to pick your fittings. Keep the bathroom simple, that way it’s easy to use accessories for a new look if you fancy a change. Your new kitchen can be worked to fit your needs – add some open shelving for interest and extra storage. Look around for your perfect tile, your dream worktop and think carefully about a flexible flooring that will fit your style. The same applies to the walls – before you whip out the paintbrush, make sure that the shade is one that you can live with. It’s easy to be influenced by on trend colours, but when you move into a new home, it often takes a while to work out what your style is. Keep it neutral and then add in the colour or pick a feature wallpaper once you’ve lived with it for a while. The biggest misconception when it comes to furnishing your new build home is that it needs to be, well, NEW. It doesn’t. The best homes mix old and new and the juxtaposition of the different styles is what makes your space individual. Check out eBay or your local charity shops for interesting items – choose what appeals to you and go with your gut. There’s nothing more striking than a mid-century sideboard teamed with a modern graphic print, or a vintage tea trolley topped with a selection of favourite colourful gins and cool brass bar apparel. Create a gallery wall using a mixture of old and new prints – again, go with what you love by including family photos, old favourites, bold typography or a vintage find. When you’re styling your new rooms, an important factor in making them work for you is to use texture and layering. Think natural materials such as wood, glass and marble and layer up those textiles. No sofa is complete with a couple of cosy throws and cushions in fabrics such as velvet, wool or natural cotton. Choose a rug that doesn’t overpower the room, in soft tones that suit your room style and go as big as you can. Create points of interest by layering magazines on a side table next to a seat for easy access, or make a feature of your coffee table by adding a tray with accessories such as a candle, a book or an ornament. And most of all, make sure you add greenery – incorporate a leafy plant or two to finish off the space. No room is complete without bringing the outside in. Buying a new build is a truly exciting process and there’s so much that you can do to transform your blank canvas into a home that is perfect for you. Miller Homes have been building beautiful homes since 1934 and during the last 80 years, have built around 100,000 new homes using the highest quality materials and utilising the best workmanship possible. 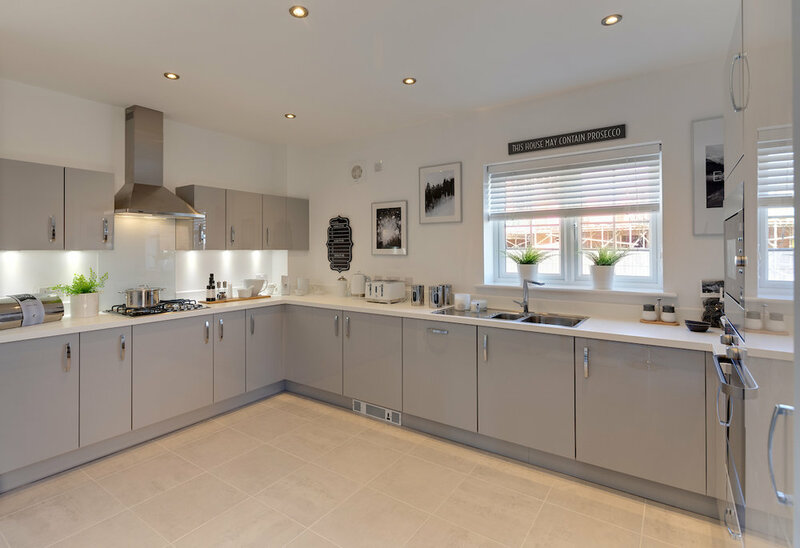 Click here to find out more about what Miller Homes can offer you and how you can purchase your very own ‘blank canvas’. This sponsored blog post was in collaboration with Miller Homes. I would never promote any brand or product that I did not truly love and would not use myself.